This page discusses the violent cut at , which is considered an overplay but definitely not easy to refute. The normal continuation for black is to play . Then with and further, white turns the position into a variation of the nadare joseki. By playing like this, black can also get into the same position from the small nadare joseki. is a trick play, and so is the position above. See small avalanche - trick play for the correct response to the trick play. erislover: I am hardly an expert but this seems the natural move to me. After I do not see how black can get a good result. erislover Thanks for your input. 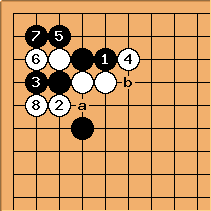 I read a ko from black's play, so white isn't out of options, but your "correct move" sequence is better than that. Thanks! 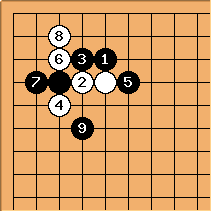 If black plays and then cuts with , white stretches and black loses his stones. Black cannot captur white if she answers a with b. 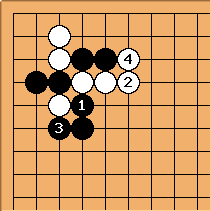 Note that after exchanging a for b, the geta at c does not succesfully contain the white group, as white can push trough at d.
What if black responds to 3 with 4? I tried out a few sequences and black seems to get a good result. Is there a way for white to take advantage of black's joseki deviation? PetriP? You could read the article by Alexandre Dinerchtein from http://www.go4go.net/english/article/tricky/ . I think B is quite okay anyways not too bad, if You rememer/understand all the variations. AndyPierce: I'm no expert but my guess is the usual thought would be for white to add a second stone to and sacrifice both in order to seal black into the corner and blight the stone. White has some cutting points to deal with, but should be able to handle it (probably white fixes up at a next). Black's corner is only 10 points (if black eventually takes ) and black's play has been inconsistent with his intent to develop on the left side. Bill: The descent, , attacks both - and - . Black is in trouble. Bill: For instance, if , defends against the ladder ( ). Now if , is solid. Black's disadvantage is clear. Bill: Black might try , but is an adequate reply. Now through is still good for White. Dieter: If here, she ends up with two severe cutting points.